Something about me you should know, I like being thrifty and finding a good sale. 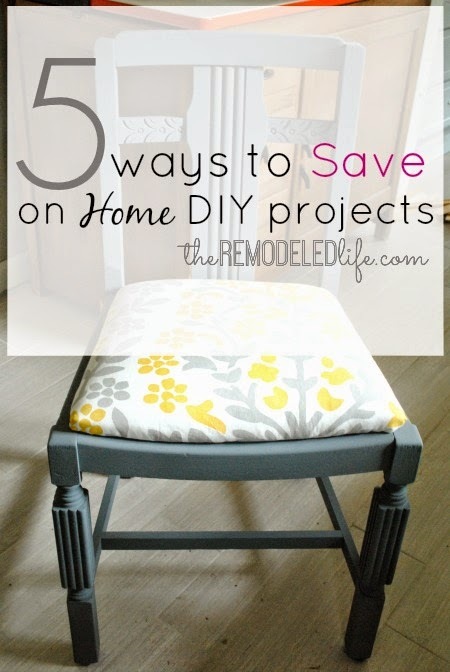 Through the years I have found a few ways to be able to save money on all of those home projects. Whether it be for smaller decor items or bigger ticket items, there are ways to save some pennies. Check out a few below and some project ideas too! 1. Paint - One of the easiest ways to change up your spaces in your home. When we moved in we had to paint pretty much every inch of our house, in and out. All of that paint really starts to add up. There are ways to find paint very inexpensively. Depending on your project you may not be that set on a certain shade or, if you are really patient you might just luck out. My favorite place to check out every time I visit Lowes or Home Depot is the Oops paint section. Usually its a little shelf nearby the paint mixing area. Gallons go for $5 and quart for $2.50 (usually). 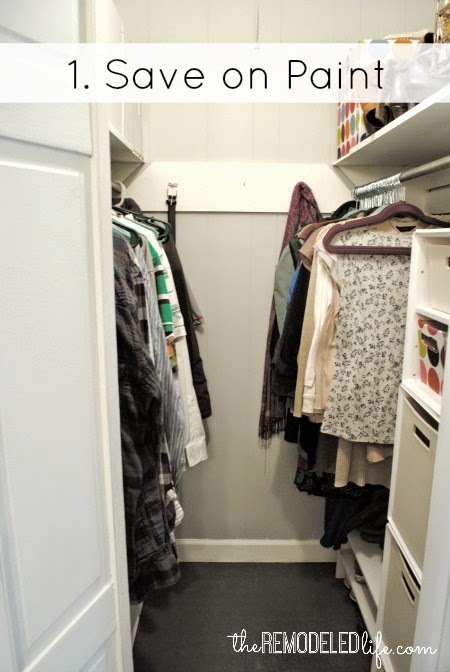 I painted the inside of our walk-in closet and our laundry room floor with paint I found on the oops shelf! 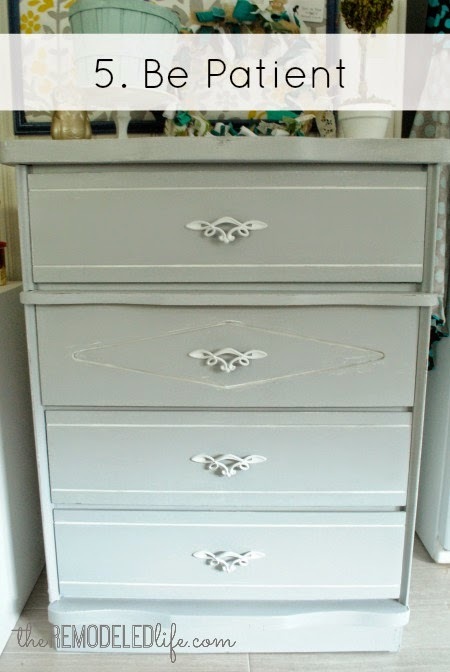 I have also painted several pieces of furniture with oops paint as well. Like I said, I check every time and if its something I like I usually grab it...you never know! Another great place to check for discounted paint is the Habitat Restore, another place for finding paint for those furniture projects! 2. Fabric - I mentioned this earlier this week when talking about recovering our ottoman, but I get creative when searching for fabrics for different home projects. Fabric from the fabric store can often add up if you need a lot for a project. So, I'm always on the look-out for discount fabric items I can re-purpose into something. I'm talking about shower curtains, sheets, table cloths - anything. Target is a great place to look for these kind of items in the clearance section (usually the aisle end caps). This is another thing I often check when I have the time. Also, don't throw away any of your scraps. I have used fabric scraps for jewelry, wreaths and garlands. I never waste a inch. 3. 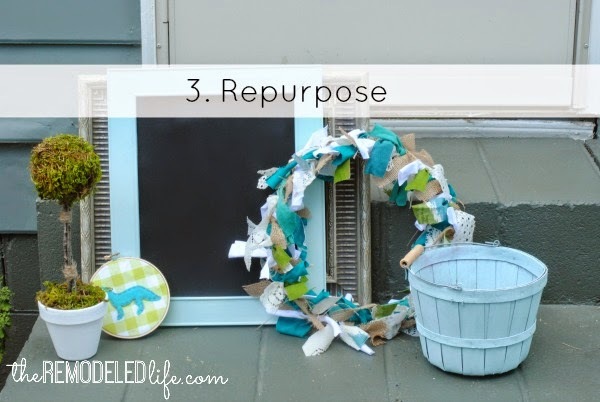 Repurpose - Lots of times you have things already in your house you can repurpose into something new. Anything from gift bags and paint chips turned to artwork to chop sticks and washers into a fun mirror accent - you never know. 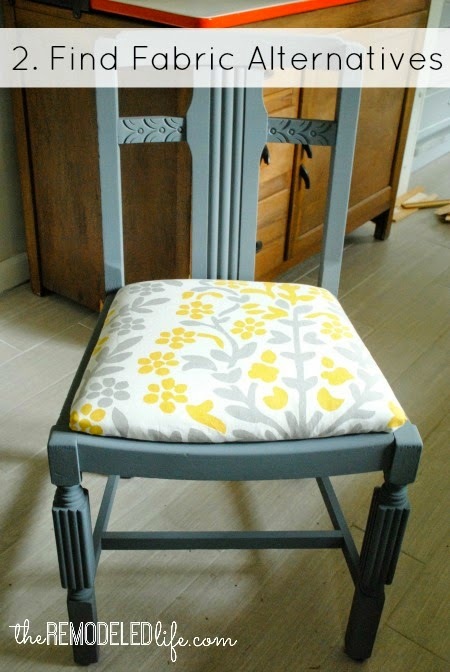 What items are lurking around your home that could be reused and made into something cool? 4. 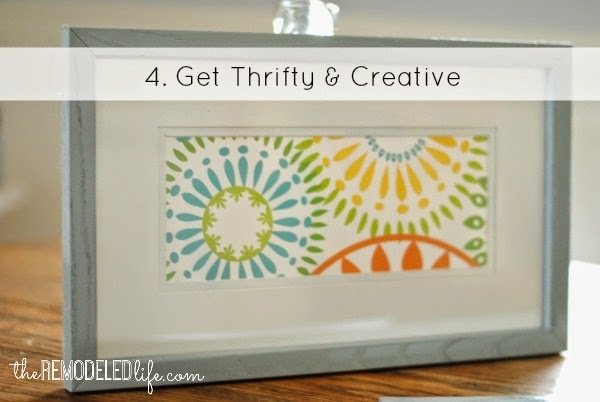 Get Thrifty & Creative - You don't have to be a thrift store pro to find a good piece to redo. I don't have time to constantly check craigslist, go to yard sales every week or even to thrift stores every week. But, if I'm on the hunt for a certain thing I will always check these places first. You never know what you might be able to find. Every so often I will pop into our local restore and just check out what they have. I have found some awesome deals, especially when they have marked down an item. After an item has been in their store for over 30 days it gets drastically reduced. Restore is also a great place to find doors and old wooden chairs. Two things I love. A cabinet door plus some chalkboard paint can become a really cute project at almost nothing - thrifty and creative! And, don't forget free things like pallets! We have made chalkboard signs out of pallet wood and recently repurposed one into a shelf. 5. Be Patient - This one is hard I know! But, just taking some time to research prices and wait for sales is huge. Also being patient will allow you to really figure out what you need. Sometimes we can be drawn to something but realize later its just not going to work. Being patient helps weed out those impulse purchases. Those are just some of the ways we have saved on diy projects around our home. Do you have any more ideas? Share with me!